Hey, sweet SHINE girls! I have asked my precious friend, Rebekah, to post today. My day was very full yesterday, so on a whim I asked if she could post. I am so glad she did! Be blessed, friends! HAPPY FUN FRIDAY, SHINE girls! :) I love our readings this week. Paul's letter to Timothy in 1st Timothy is a good "how-to" of the Christian faith. Timothy was a new, very young preacher and Paul took a great opportunity to encourage him. Which is really precious. Ok, so I have a story for you. It's good! 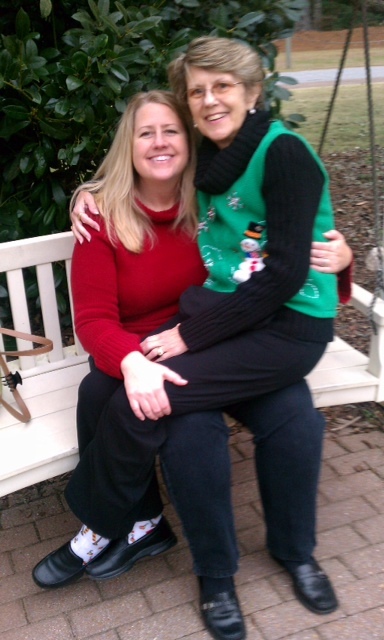 During the holidays, a dear friend of mine- and a fellow SHINE girl, Lori Gabrielson, lost her precious mother. Very simply, Lori's mom had been fighting a terrible disease for many years and all of the sudden, in a very rapid decline, Penny Polley was gone. Penny was a nurse, very well respected in her field and in her church and women's Bible study. She was a wonderful wife and mother. Isn't it funny how someone like Penny can make you feel like a real grump? She always had a smile on her face, she always LOVED people and they loved her right back, meanwhile, she probably almost never felt good in the last 3 years of her life. Pancreatic cancer certainly took its toll. Yet, she always made sure to love and encourage. During her memorial service, I was really struck by one thing as Lori courageously took the stage to talk about her mom. In Penny's final hospital stay, Lori explained that her mother told everyone who helped her, "Thank you for taking such good care of me... God bless you!" Wow! I thought to my (analytical) self, "now... Penny was a nurse, she probably didn't always think she was being taken care of very well, did she? She might have even done it better herself?" But, it wasn't about her feelings, it was about encouraging others. Penny loved and invested in people and how they felt, then she brought up Jesus. When I left the memorial service, I hit the Chick-fil-A drive thru. :) I thought of Penny, I was totally inspired and challenged and curious to see how people would respond to her words. I started that afternoon, echoing Penny. You know what, PEOPLE LOVE TO HEAR, "Thank you for taking such good care of me." Strangers light right up! Then, just like Penny, I say, "God bless you!" Ok, this is your FUN FRIDAY challenge and your every day challenge. Make the day of a stranger who checks you out, helps you find the Velcro at Target (true story) or the man who loads your heavy bags. You will be amazed what light Penny's words bring to their eyes. :) The words somehow spread Jesus in a really refreshing and life giving way. I love to do this, y'all. I really love it! "Thank you for taking such good care of me... God bless you!" Encouraged and inspired, thank you Penny!